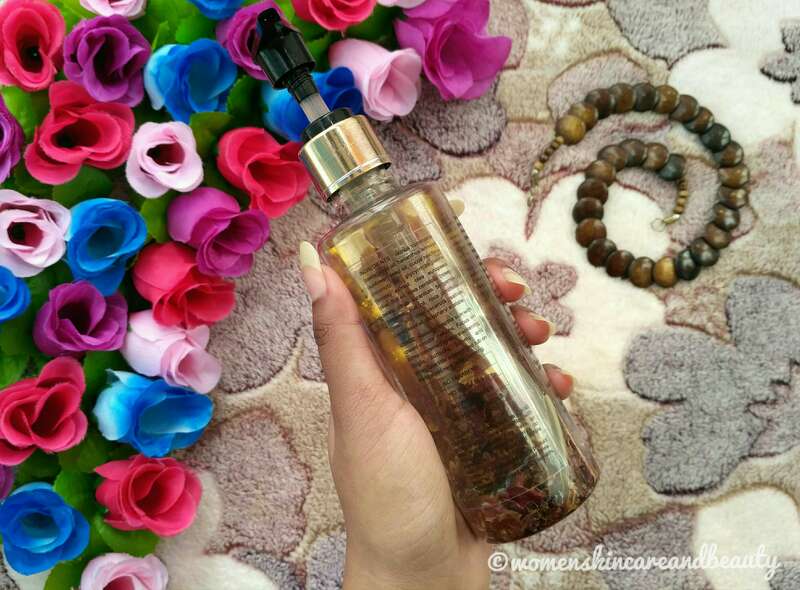 DESCRIPTION: Tvakh’s Mystic Rose Body Oil is something of a renaissance. Infused with active blend of Licorice and Carrot Seed Oil is a natural solution to reverse pigmentation and skin tanning, while Carotenes from Carrot Seed Oil act as a potent antioxidant preventing the skin from free radicals from cellular damage. Perfumed with natural essences of sun dried Rose Petals – captivates your senses, rejuvenates your muscles and relaxes you from within. INGREDIENTS: Ricinus Communis (Castor) Seed Oil, Helianthus Annuus (Sunflower) Seed Oil, Cocos Nucifera (Coconut) Oil, Glycyrrhizaglabra (Licorice) Extract, Olea Europaea (Olive) Fruit Oil, Rosa Centifolia (Rose) Petals, Citrus Aurantium Bergamia (Bergamot) Fruit Oil, Rosa Centifolia (Rose) Oil, Daucuscarota Sativa (Carrot) Seed Oil, Tocopheryl Acetate. No parabens. No SLES/SLS. No phthalates. No petroleum oils. USAGE: Massage into the skin with upward circular motions. Focus on zones concerned by skin slackening (thighs, buttocks, tummy and arms). Take little amount and rub on the face and neck for de-tanning. SAFETY INSTRUCTIONS: As with all products which come into contact with skin some people may have an individual sensitivity/allergy to ingredients. Do a patch test before use. Some of the ingredients in the product tend to change color over time. However the product efficacy remains unchanged. COST: Rs. 860 for 200ml. 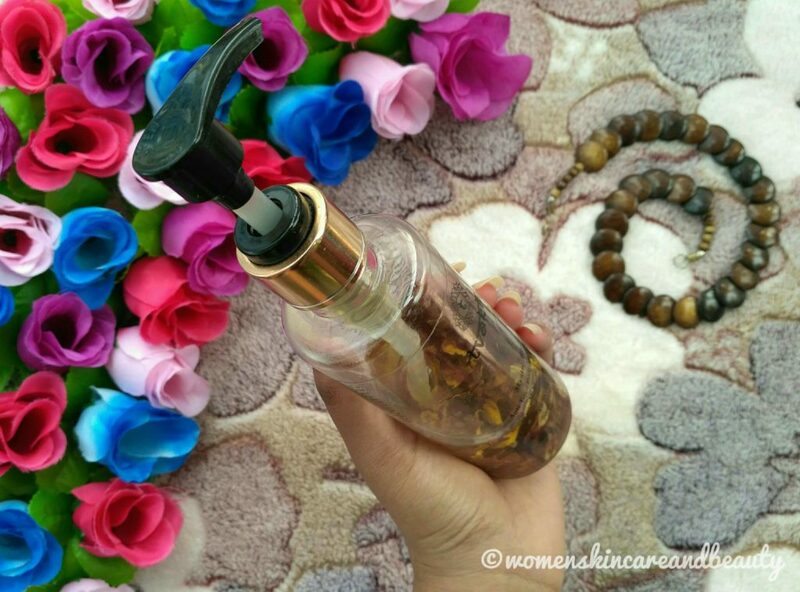 The oil, when present in the bottle, has a beautiful yellowish-golden tinge to it and is loaded with dried rose petals… Although, when pumped out, it comes out as a clear, transparent oil! 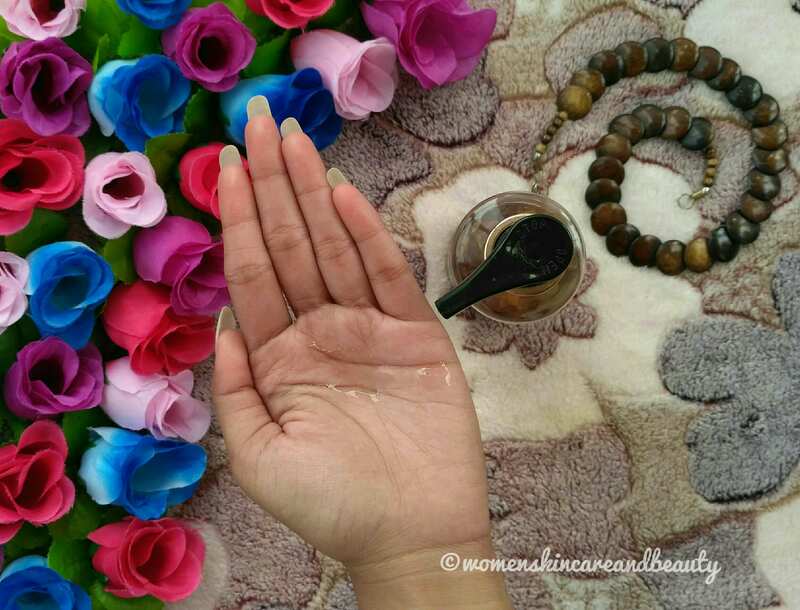 The oil is not extremely lightweight like mineral oil or essential oils but is also not too thick or heavy like castor oil… The consistency of this oil is quite close to that of sweet almond oil and is perfect for light massages! This oil leaves the skin soft and nourished post-use and doesn’t stain the clothes at all! It would keep oily to normal-dry skin types nourished throughout the day while people with severely dry skin types may feel the need to reapply it after 6 to 8 hours… Also, even though people with combination to oily skin types may find it to be too heavy or greasy for them, especially during the summer months, it doesn’t actually clog the pores or harm the oily skin! Now coming to its claims of being an anti tan – body lightening oil… I have been using this oil regularly on my tanned legs for over two months now and to be very honest, I don’t see much of a difference! It might have reduced the tan by 4 to 5% but the difference is not really visible to the eyes… Also, it didn’t do anything to even out the patches of pigmentation on my legs! So, in my opinion, this oil is not going to be of any help if you have old tan or pigmentation… But it may lighten freshly acquired tan to some extent! Easily available online on Amazon, Nykaa, Smytten and Tvakh’s own website. Free from parabens, sulphates, phthalates and petroleum oils. 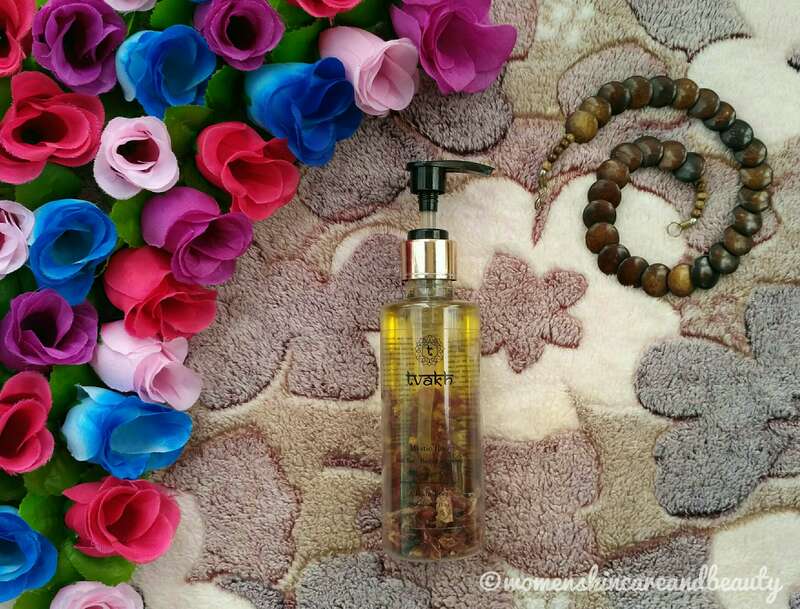 Contains skin-loving ingredients like castor oil, sunflower oil, coconut oil, olive oil, bergamot oil, rose oil, carrot seed oil, licorice extract and vitamin E.
Has a natural fragrance of rose petals. Gets almost completely absorbed into the skin with a little massage! Leaves the skin soft and nourished for 8 to 24 hours, depending on the skin type! Doesn’t make normal to severely dry skin types feel heavy or greasy post-use and doesn’t stain the clothes! Improves the texture of the skin to some extent with regular use. May lighten fresh tan to some extent. Acts as a good after bath oil for normal to severely dry skin types. Doesn’t clog pores or cause breakouts! The packaging is not travel-friendly. Doesn’t lighten old tan or pigmentation to a noticeable extent. People with combination to oily skin types may find it too heavy or greasy to use! 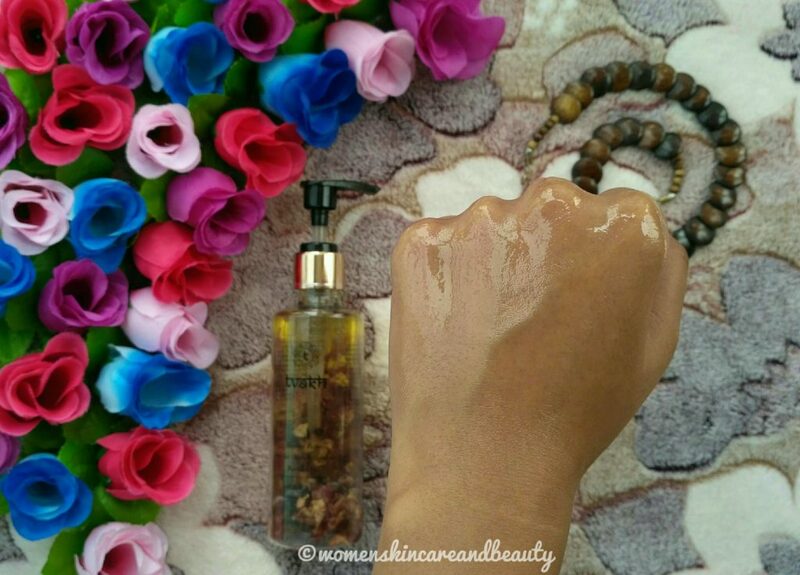 FINAL TAKE: Tvakh’s mystic rose oil is an organic, non-comedogenic body oil which keeps the skin soft and nourished for long… It may also lighten the fresh tan to some extent but doesn’t visibly reduce old tan or pigmentation! Your all reviews are always with detailed info and honest. Keep it up. Detailed reviews like this grab my eyeballs. Love this totally. What I loved the most is the flatlay photography. I love reading your reviews always. Detailed and honest. I have combination skin but my hands and legs areas are dry so I can try this definitely. Actual nothing helps in removing tan effectively than homemade recipes. This oil would be fine for people with dry skin types to some extent. I really like that it’s exclusive blend of oils that’ll moisturise and nourishes our skin. I wish it could effective in removing tan to some extent. It’s a spot on balanced review by You. I wish the product had good anti tan quality. I will have to skip this oil because I have very oily skin. Thanks for the honest review. All ingredients are really good for skin..Nice detailing review.. I love your reviews. They are detailed and complete. Also, love the way you style your shots. I am going to try this massage oil for sure. I really commend you for your honest reviews, Mrinal. I never heard of tan-removing oil and feel that this one doesn’t too. For that price we can have other usable options, right? This anti-tan body lightening oil seems not very much effective on skin but good for moisturising if you have dry skin.. very nice review.. I think it will be a good choice for winters as the body requires nourishment and this one doesn’t spoil the clothes..would give it a try.. Thanks for sharing the detailed review. I am glad you shared the honest feedback about the tanning part. It is actually a expensive choice , it would be really nice if you could suggest something affordable to get rid of tanning in your next post. I haven’t tried any product from Tvakh, though this brand has been around from a while. The oil is promising but I don’t think it would suit my oily skin. Thanks for your review. The best part is that it doesn’t leaves the skin greasy and nourishes the skin perfectly . The packaging also looks good. Thanks for this honest opinion I have dry face will think of trying the Mystic Rose body lightening massage oil once and come back with my opinion on this. My legs are badly tanned after 2 back to back beach vacation. I need a quick result. Will look for a quicker solution. Amazing and beautiful post. 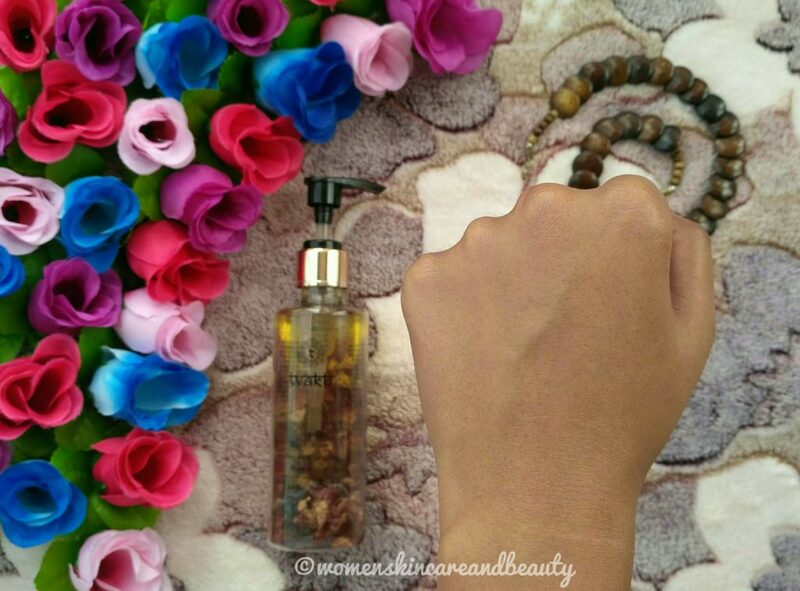 Tvakh’s mystic rose oil sounds good for the skin. The packaging is so pretty. The packaging of bottle is very attractive. I liked the way you have described the oil specifications as per skin type. These days dry oils are preferred by people and they dò not stain clothes either. As you said this oil can be heavy for some people makes it less versatile. Good that you tested it for about 2 months before sharing a review. Wish it did what it claimed. 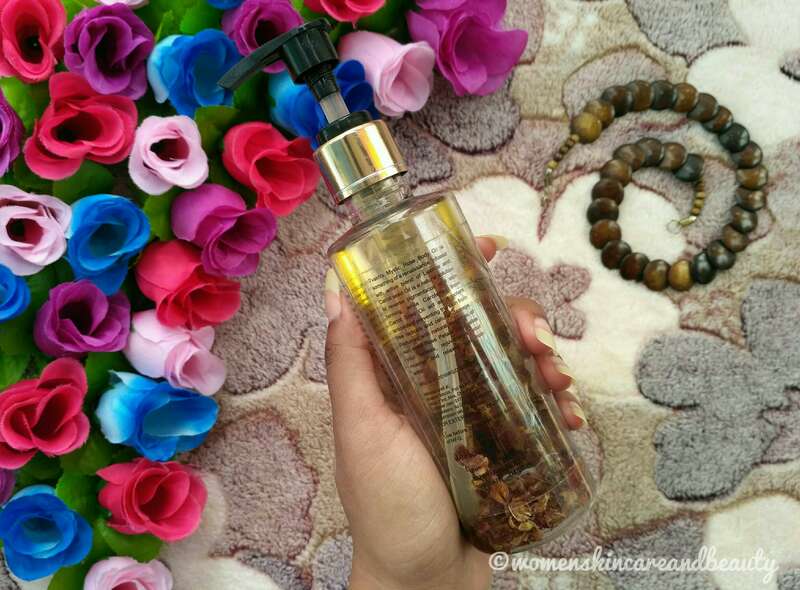 I love the way you explained about the anti tan oil I was actually about to buy it and this is indeed a helpful post to me. Hmmm if the product doesn’t remove the tan, then it defeats its purpose. I’ll avoid buying this. Thank you for your review. Thanks for sharing the details, looks really good for skin care but I have normal to oily skin . I think I need to skip this. That’s a detailed review and with pictures, it becomes more clear to decide about buying. I must say the way you take shots of the product is really so good. such a beautiful way explained review. Organic products are amazing for our body. It is good that it keeps the skin moisturized for longer period of time. Thanks for sharing this honest review. I love body oils. They are just so nourishing for the skin. Rose is such a beautiful ingredient and I would love to try this. I like products that help to improve texture of skin. It seems like a good product for skincare but I wish it could help to reduce old tan or pigmentation. That was a very detailed review. As my skin is oily and you mentioned it might not be good for oily skin people I have to skip this one. I would love to have a brightening effect on my skin, but I cannot put oil on it. I already have oily skin and it does not agree with any kind of oil. Thanks for the honest review. Since it is good for normal skin, having a look at its ingredients, I would really like to try this Rose oil, though it sounds lil expensive. I don’t think this is a good buy if you are looking for lightening your body for moisturizing purpose you can try. By the way i have dry skin type,hence i can use this .. Very honest review mrinal. Thanks for sharing honest opinion. I have combination skin, so I should give this oil a miss. I love the way you give an honest review. Even my skin is oily and combination. It will not suit me. Wow i loved the softness in skin, but too expensive i guess, but still worth trying! Thanks for yet again an honest review. I have oily skin and glad I read your post. Also it is expensive and looks hardly effective. This is what I like about your reviews. Balanced and honest. The oil is a good product but doesn’t reduce the tan significantly. I wonder why that is? It seems like a good product but since it is expensive, I think I will avoid it. Thank you for sharing this review.